Welcome to the Herefordshire Linux and Open Source User Group ! We are a friendly group who support and promote Linux and Open Source Software in the county via our regular monthly meetings and busy mailing list. We have members young and old, knowledgeable and new to Linux. We meet on the fourth Wednesday of most months, (except December) usually upstairs at The Courtyard, Hereford, from 7.30pm. Beginners Linux and how to choose a Distro. 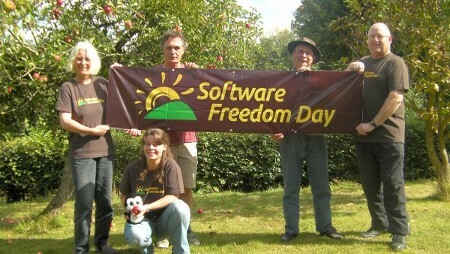 Software Freedom Day, part of the worldwide Software Freedom Celebrations. Please join our Mailing List for all the latest up to date info on meetings as these pages are only updated infrequently. We have worked on projects such as supplying very low cost Linux pc’s to Community First, so community groups can obtain affordable decent computing facilities, and our own Tuxedu project – educational software for primary schools. We have also put on demonstrations to both local Friends of the Earth and Green Party about the use of Linux and Open Source. We have held successful events in the year promoting Linux/Open Source via Software Freedom Day in September and Herefordshire Open Source Day in March. We have monthly meetings usually the 4th Weds of each month, for Linux chat and support amongst our members and occasional workshops. Please get on board and join us and enjoy using Linux and Open Source !